Celebrating Easter with a resurrection story of a more sordid sort. Thankfully it wasn’t ring-around-the-rosy that they played. Andy found himself in the middle of the trampoline, yet again blind and immobile on his back. He was dead, at least for the moment. At the fifth count, Andy stood up. His legs were shaky beneath him, and he squeezed his eyes shut tight so that he couldn’t see. But he was alive again, and he was on the prowl. With arms outstretched for balance, he hobbled around within the netted confines of the trampoline, listening for his cousins and reaching for one of them whenever he sensed they were nearby, in this dry-land version of Marco Polo. Moving from the center of the circle, Andy felt a light bounce and heard a faint shuffling sound just behind him. Quickly he wheeled around and lunged, and made contact with something. He opened his eyes to see his younger cousin Jimmy, with a sour expression on his face. “I know,” sulked Jimmy. He’d been “it” a few times already, and wasn’t interested in being it again so soon. Andy and Hank exchanged high-fives while Jimmy moved to lay down in the center of the trampoline. He was starting to suspect a conspiracy against him. As the new dead man, he clamped his eyes shut and awaited the chant that would bring him back to life. Instead, he heard something much worse. From the street on the other side of the house came the sound of screeching tires and a dull thwump sound, followed immediately by screams from Aunt Marlene, Andy’s mom. Jimmy popped his eyes open and saw Andy staring at Hank, slack-jawed and in shock. The three boys slid off the trampoline and ran to the front yard. In the street was a Trans Am, with its beautiful eagle painted across the hood. But that eagle was marred by blood. As the driver, in a daze, looked down before him, Aunt Marlene lay over the body of her husband, Uncle Todd. Andy was afraid to go up to her; she was sobbing violently and shaking his father as if to rouse him. Slowly he approached, and saw that his father’s head had split upon the pavement. It rested in a deep pool of his own blood. Silently, Andy’s eyes welled up with tears as he watched his mom’s desperate and hopeless attempts. Other family members stood at the curb and waited for the emergency vehicles to arrive. But young Jimmy wasn’t content to wait. “Get him to the trampoline! We can save him!” he said. Aunt Marlene looked up at him quizzically. He yelled again, much more insistently. “Can we … can you?” asked his aunt. “Help me move him to the trampoline!” yelled Aunt Marlene to the gathered onlookers. Desperately hysteric, she was desperate to try anything to bring her beloved husband back. Grudgingly, a few of the men picked up Uncle Todd’s limp body and carried him to the backyard trampoline. They gingerly laid him across the mesh mat. 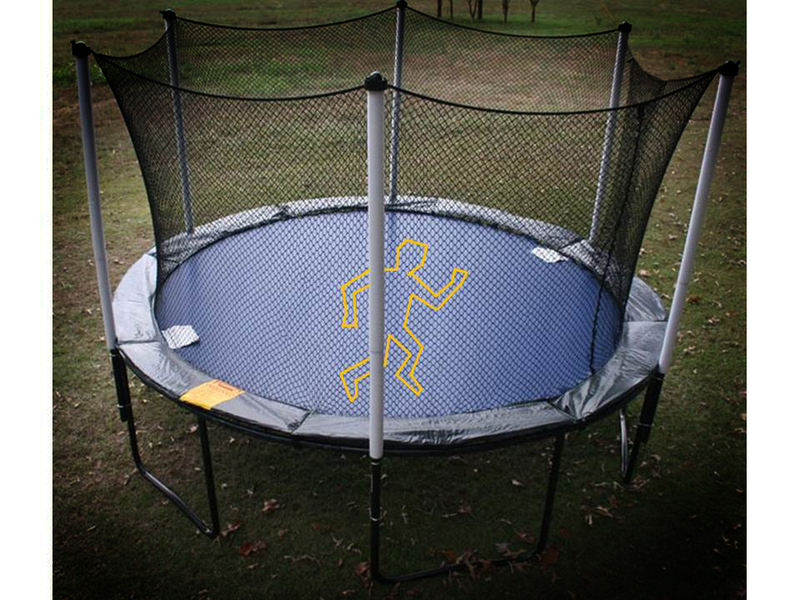 Jimmy ran onto the trampoline, while Hank and Adam followed behind. The three boys gathered around Uncle Todd’s corpse. Slowly, they walked around the body, chanting the familiar rhyme. The boys stopped and looked down on the limp form before them. Slowly, miraculously, the saw the body twitch, then the fingers stretched out. Uncle Todd was coming alive before them, just as Jimmy thought he would! Aunt Marlene stood to the side, hands over her mouth. Tears of joy replaced tears of grief as her husband stood up onto the trampoline mat. Andy, in shock but clearly grateful, gave Jimmy full credit. “Good thinking, sport!” Uncle Todd stepped across the trampoline to his young nephew. He clasped his hand on the youth’s shoulder to embrace him. When he did so, the boy’s body went limp as he collapsed to the mat, dead. “It looks like Jimmy’s ‘it’ again!” groaned Hank. ~ by Random Handyman on April 9, 2012.